Today I noticed signs all over Stanley saying they are going to try to set the a record for the Guiness Book of World Records. Something like the most dogs getting their teeth brushed at once. Who thinks of these things? 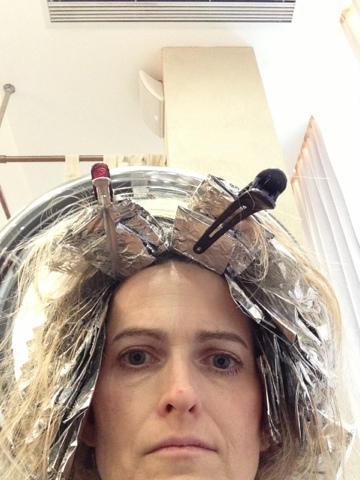 So anyway, afterward I went for some highlights at the only salon I have noticed. It was really nice! They even gave me a scalp and kneck massage. I have noticed some other things about Stanley. They have these sculptures Along the water front in a sort of art display. 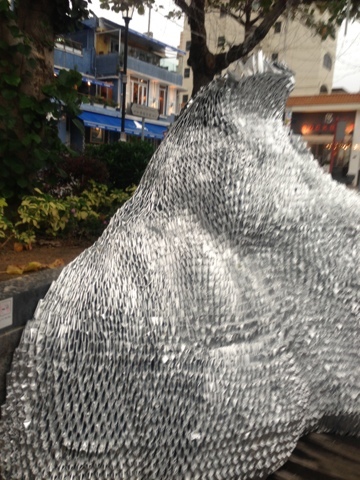 There is this big mountain looking metal thing that is made of what looks like pieces of foil. I have wondered about it. Today I figured it out while I was at the salon. . . It is a dog getting highlights! What do you think?